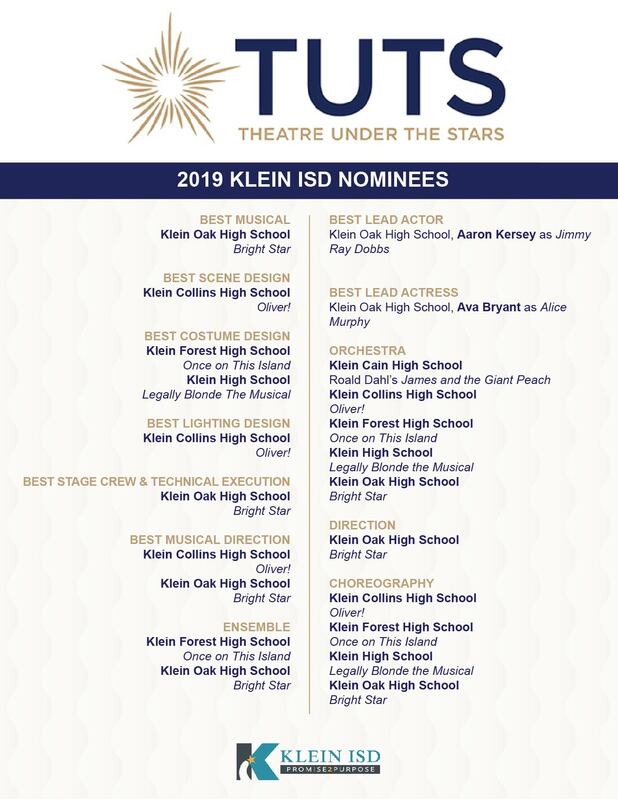 Klein ISD high schools are nominated for a total of 22 Tommy Tune Awards recognizing their outstanding musical productions this year – one of the highest number of nominations in district history. Click to enlarge the full list of Klein ISD nominees. 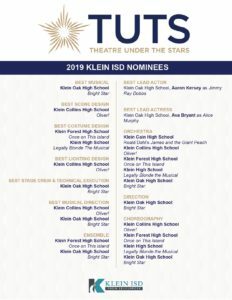 The nominations are led by Klein Oak with nine nominations, followed by Klein Collins and with five, Klein Forest with four, Klein High with three and Klein Cain with one. The schools are nominated amongst 50 other high schools in the greater Houston area. The awards will be announced on April 30 at a ceremony held at The Hobby Center. The district is full of talented learners, as each high school is nominated for at least one Tommy Tune this year. It is clear that the theatre students at each campus relentlessly pursue success throughout the production process by collaborating to build sets, perfect choreography and memorize lines and lyrics. The student owned, student-produced creations are judged by Houston-based theatre professionals to compete for nominations across 15 categories. Although the possibility of winning a Tommy Tune Award is thrilling, our rising stars remain aware of the bigger picture. Klein senior Bryndal Braithwaite, who played Elle Woods in her school’s production of Legally Blonde, understands that the key to pursuing her passion is opportunity. The awards program, administered by Theatre Under The Stars (TUTS), celebrates the educational value, artistry and community that is high school theatre, as well as recognizes the innovative learners and leaders that make it all happen. Stay tuned to see which awards our creative arts pathway explorers will bring home!